How to make healthy peanut butter? All you need is ONE ingredients, a food processor and 5 minutes. Follow my steps-by-steps tutorial for a no fail smooth homemade peanut butter recipe. How to make healthy peanut butter? Are you a peanut butter addict too? My family is having peanut butter every single morning and we recently devote an addiction to flavored peanut butter – especially chocolate peanut butter. While I love my natural store bought peanut butter brand, I found the flavored peanut butter quite expensive and often loaded with sugar or additives. So, I asked myself how to make healthy peanut butter from scratch? It is actually ridiculously easy to make your own peanut butter at home. The most difficult part is to reach the right balance of color and texture. Those are the 3 important things to know before you start making your homemade peanut butter. 1- Peanuts – choose the right one ! Use roasted peanuts rather than raw peanuts. Roasting nuts helps releasing the oil from the nuts and create a smoother spread, easier to blend, while adding a deeper flavor. Roast the peanuts yourself. You will control the roasting time and temperature which ensure higher nutrient. I am buying raw peanuts with skin on and I roast them at low temperature (180 C/350F) for less than 10 minutes to release their oil but keep most of the nutrient. Keep some peanuts skins ! the skin add an even deeper nut flavor to your peanut butter while giving a lovely light brown color to your spread. I recommend to roughly remove half of the skin after roasting the peanuts or it is too hard to process. Below you can see the HUGE color difference between a homemade peanut butter made of roasted peanuts with no skin and roasted peanuts with skin on. 2 – Food processor or blender ? Make sure the amount of peanuts cover the blade perfectly or it won’t blend properly. Usually 4 cups are perfect for a large food processor. Note that 4 cups of peanuts create about 2 cups of peanut butter. 3 – Additives : Oil, salt ? If you are making a natural smooth peanut butter all you need is peanuts. NO oil, NO salt! 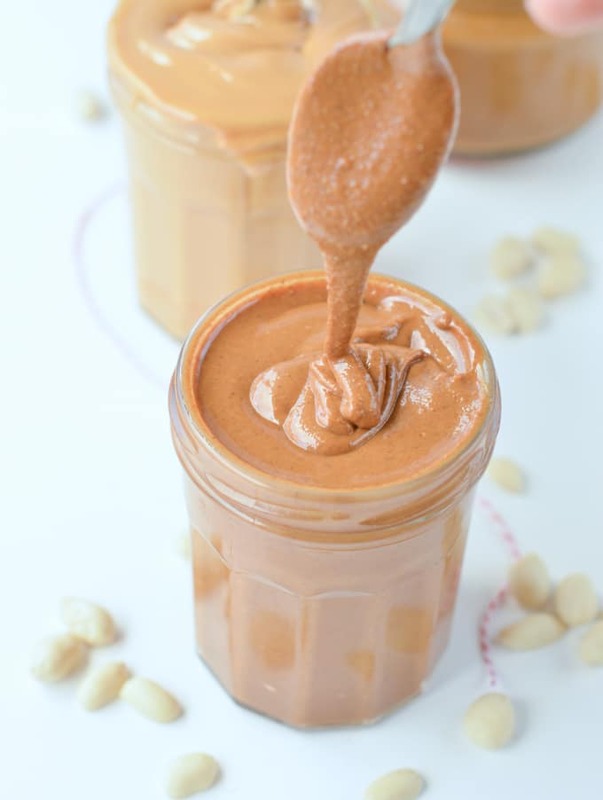 I recommend to add a tablespoon of melted coconut oil or peanut oil in my flavored peanut butter recipes simply to balance the texture – it keeps the spread very smooth. Adding ground cinnamon or maple syrup make your peanut butter thicker so it is better to add extra oil if you like smooth spread that is easy to spoon from jar. Eat it raw or add some flavors ! 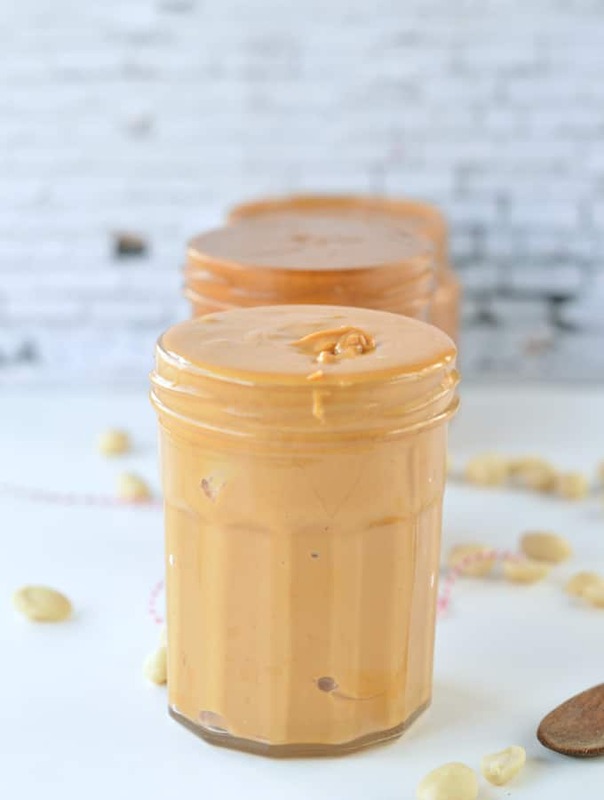 Natural peanut butter is pretty easy to make and my recipe below create 2 cups of smooth peanut butter using 4 cups of roasted peanuts that you simply blend for 5 minutes. You can use this peanut butter natural or to make my dark chocolate peanut butter spread recipe or my cinnamon peanut butter spread recipe. Enjoy the tutorial and starts making your own peanut butter now ! you won’t regret it. 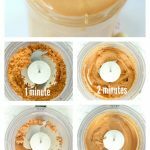 How to make healthy peanut butter in your food processor in only 5 minutes with only natural ingredients. A steps by steps video tutorial and 2 flavored peanut butter recipe: dark chocolate peanut butter and cinnamon peanut butter. Process for few more minutes - usually less than 2 minutes. Now the peanut butter is forming ! 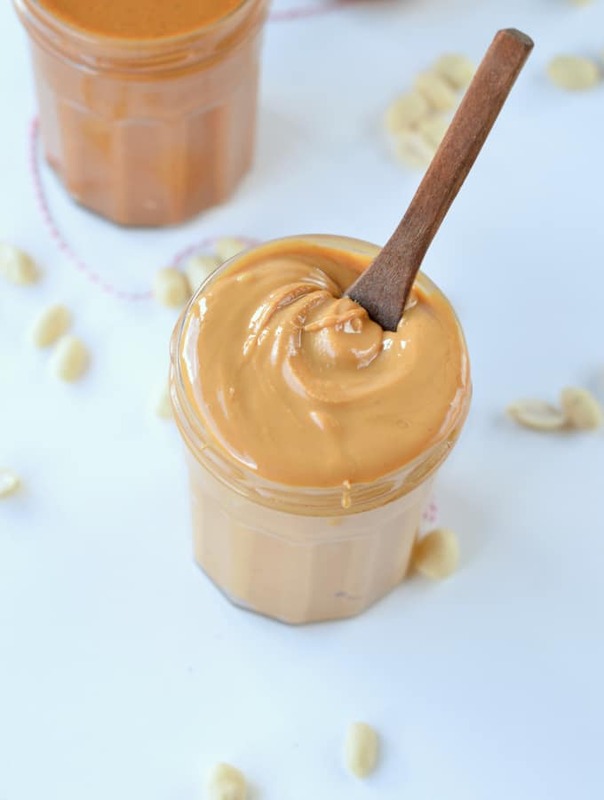 It is super smooth, lukewarm, glossy and ready to spread on toast or to use in the next flavored peanut butter recipes. 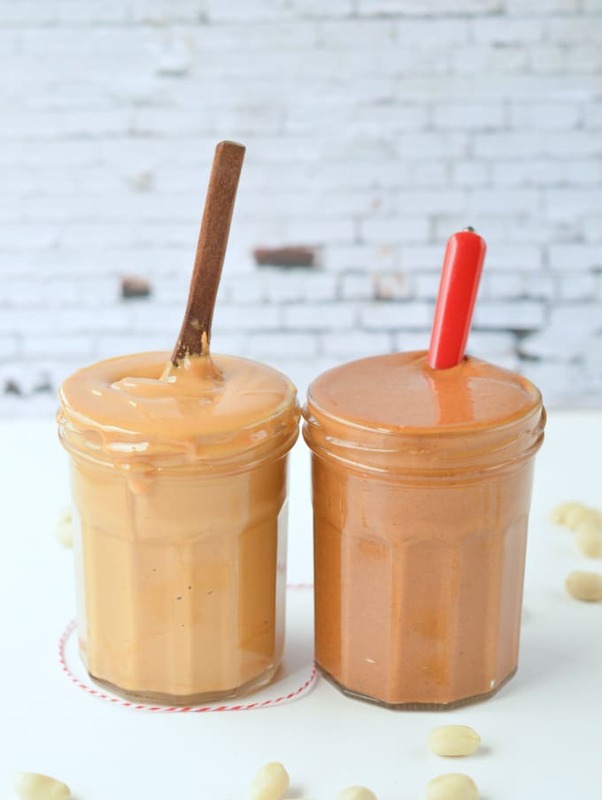 You should obtain 2 cups of natural unsalted peanut butter with this recipe. Peanuts choice: for a faster recipe you can buy roasted peanuts without skin. I love to use raw peanuts with skin on and roast them myself. I only remove half the skin from my roasted peanuts to keep extra fibre and it also add an extra nutty flavor to the spread. Quantity: note that 4 cups of peanuts create 2 cups of peanut butter. Nutrition panel is for one serve of homemade peanut butter. This recipe makes 2 cups of smooth peanut butter, 60 servings. 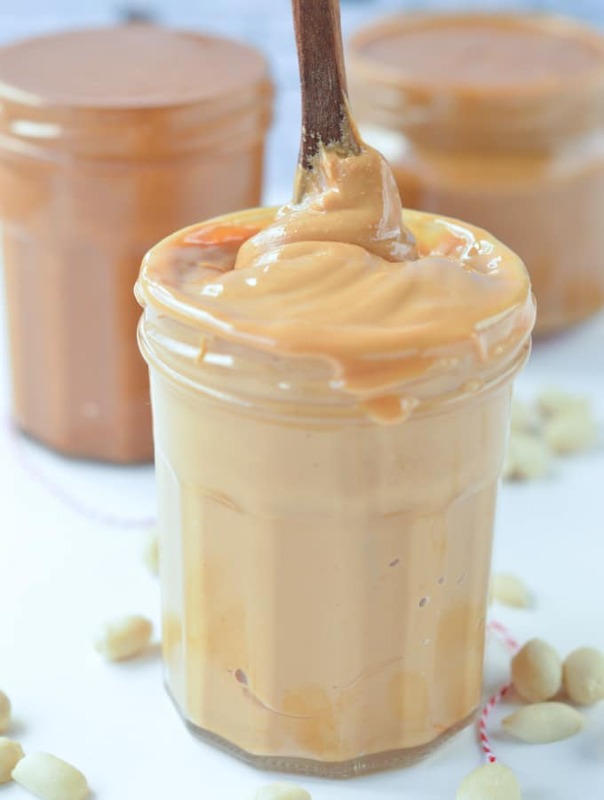 Homemade peanut butter is the ebst, and so simple to make ! Enjoy the recipe. XOXO Carine. This is an awesome recipe/tip. Thanks for sharing. Been on keto for 6 weeks and PB hits the spot. Love the flavored variations. I am so glad you appreciate the flavored PB option I provided here. I am a PB lover too and the cinnamon one is dream ! Enjoy the keto baking recipes on the blog, XOXO Carine. 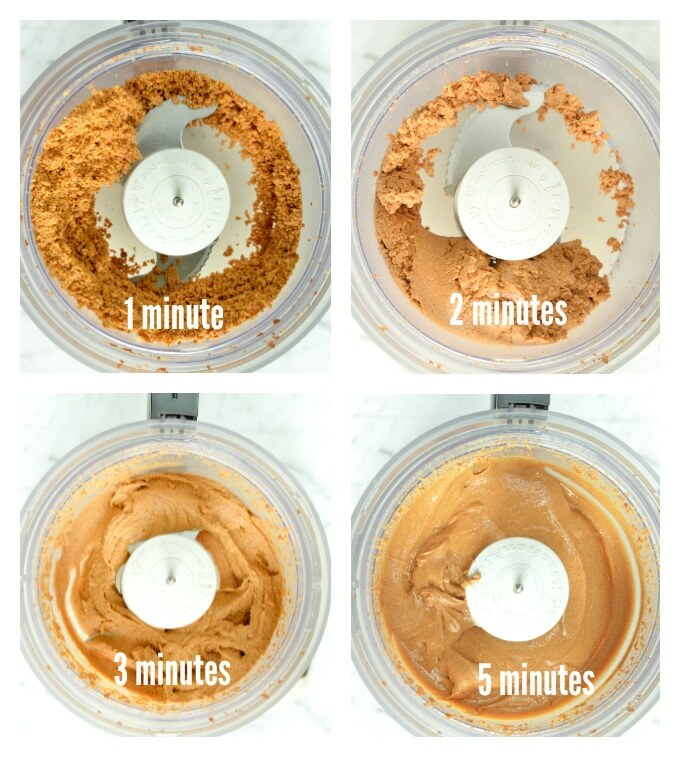 This is a very thorough step-by-step process on how to make a delicious peanut butter (and two flavored variations). I do however have a few questions, specifically on storage. After I make this peanut butter, should I store it at room temperature or in a refrigerator? I do not mean it as in a sense of whether or not the peanut butter would stay good or not—it will at room temperature—but rather on whether or not storing it in the refrigerator will prevent any oils from rising up from the peanut butter. Also, if I were to add a little bit of salt to my peanut butter for taste, would I need to add anything to it? Thank you! Thank you for trying my peanut butter recipe ! adding a pinch of salt is a great idea, simply add at the end of the blending process, 1/4 teaspoon per 2 cups of peanuts sounds great. I never store my peanut butter in the fridge because it gets harder and difficult to spread, plus it doesn’t prevent the oil to separate from the nuts either so I do prefer to store mine in the pantry. I hope this is helpful! Enjoy the low carb recipes on the blog, XOXO Carine.